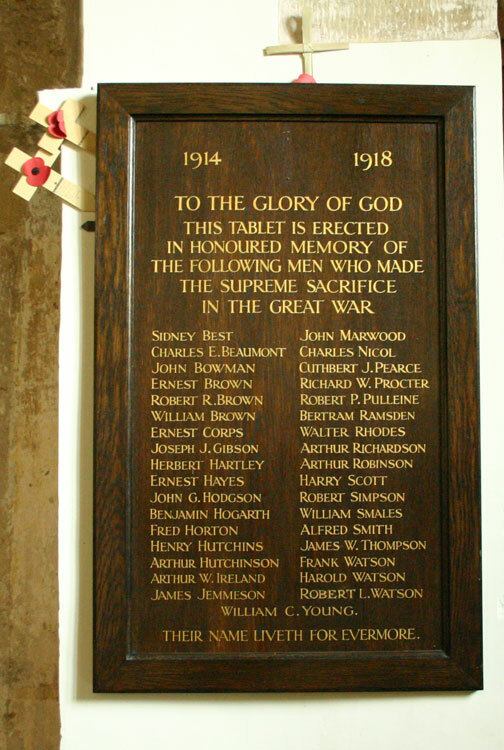 The First World War Roll of Honour in St. Agatha's Church, Easby. 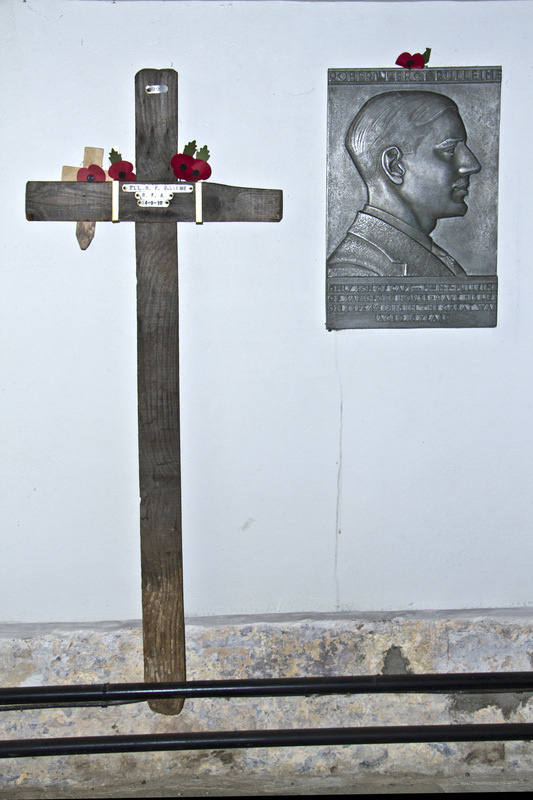 Inside St. Agatha's Church, Easby, is a Roll of Honour for the dead of the First World War. Of the 35 names commemorated, 18 are for men who served with the Yorkshire Regiment. However, there is some uncertainty with regard to some of these names. Private Sidney Best. 1785. 4th Battalion Yorkshire Regiment. Son of Matthew and Mary Best, of Welbury, Northallerton. Joined the Territorial Force in 1913. Killed 3 May 1915. Aged 19. Born Welburn, Enlisted Catterick, Resided Darlington. (There is also a Private S Best. 15868. 6th Battalion Yorkshire Regiment. Husband of Mrs. A. E. Best, of 37, Outram St., Darlington. Killed 30 September 1916. Born Pitsmoor (Sheffield), Enlisted Pitsmoor. Private John Bowman. 7606. 10th Battalion Yorkshire Regiment. Son of Joseph and Elizabeth Bowman. A Reservist. Returned from South America, Aug., 1915. Killed 20 September 1916. Aged 32. Born North Ormesby, Enlisted Middlesbrough, Resided North Ormesby. Private Ernest Brown. 19394. 8th Battalion Yorkshire Regiment. Grandson of Robert and Sarah Brown, of 9, Boyne St., Rise Carr, Darlington. Killed 28 September 1917. Aged 19. Buried NEW IRISH FARM CEMETERY. Private Ernest William Hayes. 20674. 8th Battalion Yorkshire Regiment. Killed 7 June 1917. Commemorated Panel 33, Ypres (Menin Gate) Memorial. Private Herbert William Edward Hartley. 5611. 5th Battalion Yorkshire Regiment. Killed 11 November 1916. 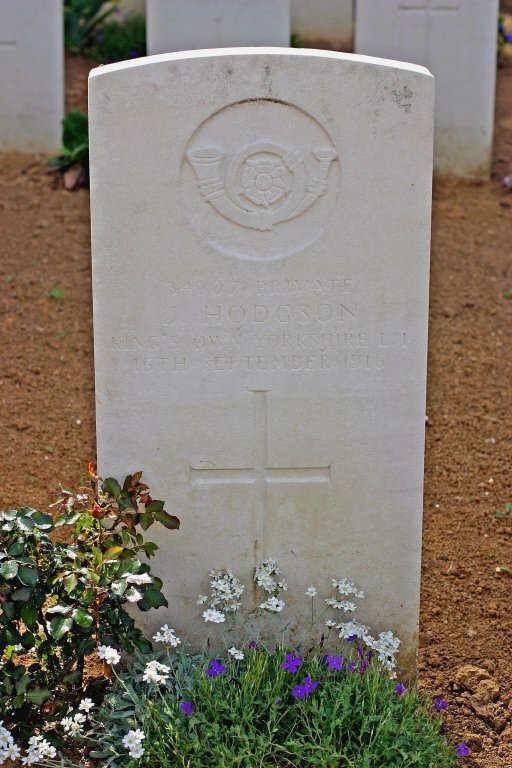 Private John George Hodgson. 34907. 9th Battalion King's Own (Yorkshire Light Infantry), formerly 5395 Yorkshire Regiment. KIlled 16 September 1916. Buried VILLE-SUR-ANCRE COMMUNAL CEMETERY EXTENSION. Private Leonard Hogg. 3521. 4th Battalion Yorkshire Regiment. Son of Mrs. Hogg, of 16, Tower St., Richmond, Yorks. KIlled 14 February 1916. Aged 21. Private Frederick William Horton. 200167. 4th Battalion Yorkshire Regiment. Son of Mrs. Mary Horton, of 33, Bargate, Richmond, Yorks. Killed 23 April 1917. Aged 20. Born Richmond (Yorks), Enlisted Richmond. Private Arthur Hutchinson. 18774. 8th Battalion Yorkshire Regiment. Killed 16 July 1917. Born Northallerton, Enlisted Richmond, Resided Skeeby (Darlington). Private James Jemmeson. 2001. 4th Battalion Yorkshire Regiment. Son of Aaron and Ann Jemmeson, of 74, Commercial St., Norton, Malton, Yorks. Native of Old Malton. Killed 2 June 1915. Aged 22. Born Old Malton, Enlisted Northallerton, Resided York. Buried STE. MARIE CEMETERY, LE HAVRE. Serjeant Charles E Nicol, DCM, MM. 30446. Machine Gun Corps (Infantry), formerly 2028 Yorkshire Regiment. Son of James and Fanny Nicol, of Hornby Castle Gardens, Bedale, Yorks. Killed 10 April 1918. Aged 26..
Commemorated Panel 11, Ploegsteert Memorial. Private Walter Rhodes. 20195. 4th Battalion Yorkshire Regiment. Killed 21 April 1917. Born Knaresborough, Enlisted Catterick (Yorks). Buried HIBERS TRENCH CEMETERY, WANCOURT. Private Arthur Richardson. 30446. 2nd Battalion Yorkshire Regiment. Killed 16 December 1916. Born Brompton-on-Swale (Yorks), Enlisted Richmond (Yorks), Resided Brompton. Private Harry R Scott. 35768. 5th Battalion Yorkshire Regiment. Son of H. and Susan Scott, of 60, Brook St., Dawlish, Devon. Died 7 December 1918. Aged 26. Born Manhead (Devon), Enlisted Cheltenham, Resided Winchcombe. 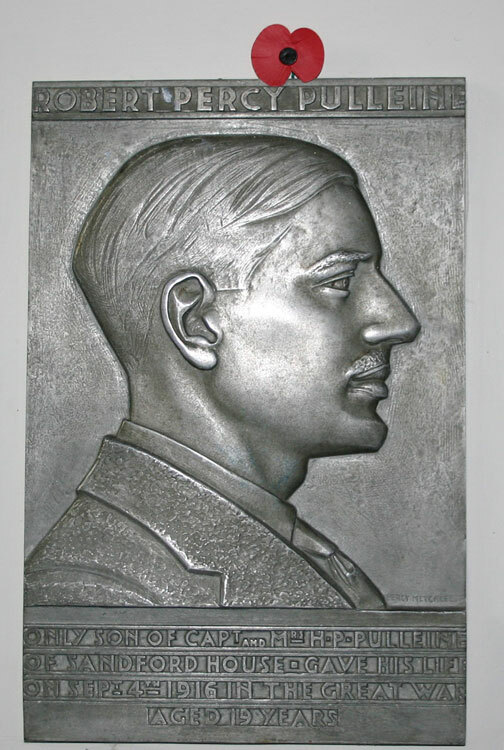 (It seems unlikely that this Harry Scott is the one on the Easby Church Memorial, but there are no other "Harry Scott" names in SDGW which seem to fit in a better way). Private Robert Simpson. 204077. 10th Battalion Yorkshire Regiment. Killed 26 October 1917. Born Brompton (Yorks), Enlisted Northallerton, Resided Brompton-on-Swale. Serjeant Alfred Smith. 200396. 4th Battalion Yorkshire Regiment. Killed 12 April 1918. Born Richmond (Yorks), Enlisted Richmond, Resided Moortown (Leeds). Buried PONT-DU-HEM MILITARY CEMETERY, LA GORGUE. Private Robert Watson. 22834. 7th Battalion Yorkshire Regiment. KIlled 22 February 1917. Born Gilling West (Yorks), Enlisted Richmond. In St. Agatha's Church, there is a wall plaque dedicated to Robert P Pulleine, and a window dedicated to James W Thompson. Photos are shown below. 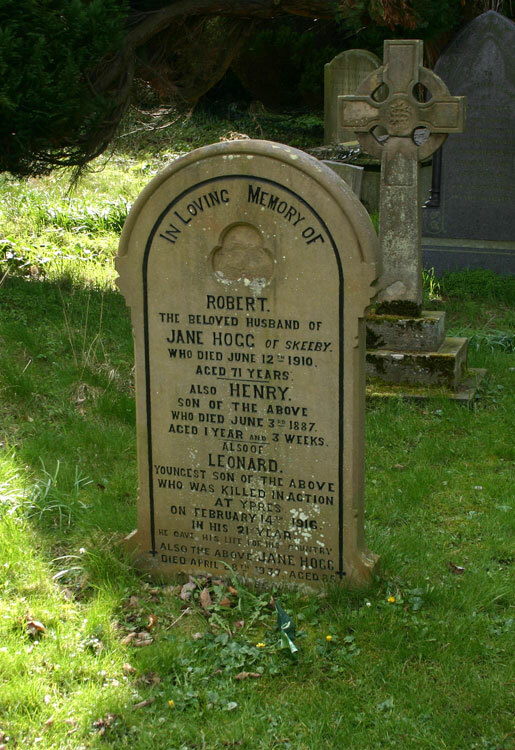 There is also a tombstone in the graveyard, where Leonard Hogg (of the Yorkshire Regiment) is commemorated. Alongside the plaque to Robert Pulleine is the Battle Cross which marked his original place of burial. The plaque dedicated to Lieut. Robert Percy Pulleine, Son of Capt. Henry Percy Pulleine, and Alice Maud Mary Pulleine, of Sandford House, Richmond, Yorks. Royal Field Artillery. Killed 4 September 1916. 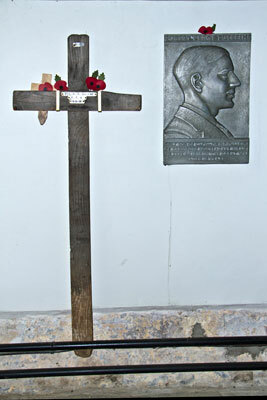 Below is a photo of the Battle Cross which marked his original place of burial. (For a larger sized image which opens in a new window, select the image below). who died on 1 November 1918, and his sister Gertrude who died on 21 November 1918. The Hogg family gravestone in Easby Churchyard, where Leonard Hogg of the Yorkshire Regiment is commemorated. John George Hodgson, 34907. KIng's Own Yorkshire Light Infantry. 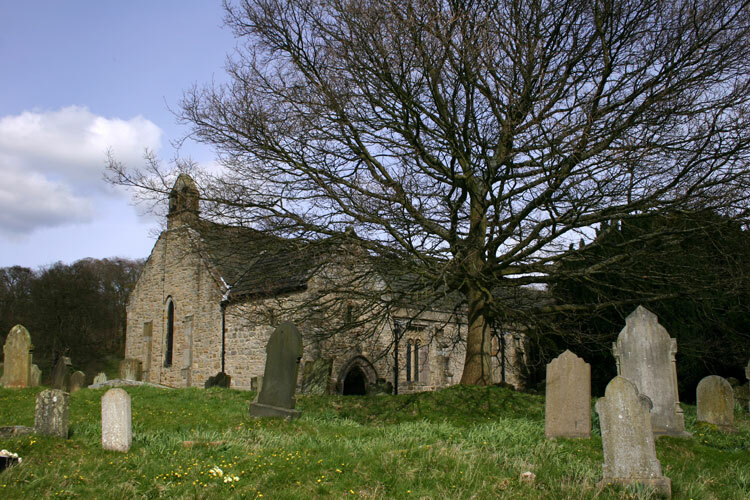 John George Hodgson was the 3rd son of William Hodgson and Maria Hutchinson and was born in 1882 in Melbecks (in Swaledale, near Gunnerside). He had two older brothers (Joseph William, born 1877) and (David, born 1880). He also had a younger sister, Margaret Ann (Born 1888). The family were farmers and lead miners who moved to Minto Grange in Brompton-on-Swale in the late 1880s. In 1911, John was 29 and working in a Brewery (probably the Crown brewery) in Brompton-on-Swale. He was unmarried. John enlisted (probably when war broke out) in Richmond and enrolled as Private 5395 in the Yorkshire Regiment. From his military records it looks likely that on his arrival in France (around 16th July 1916), he was transferred to the Kings Own Yorkshire Light Infantry as Private 34907. Two months to the day, he would be dead. He died of wounds on 16 September 1916 and is buried in VILLE-SUR-ANCRE COMMUNAL CEMETERY EXTENSION. A photograph of his headstone, provided by Peter Hodgson, <zedz@hotmail.com>, is shown below.